In my opinion you really need to read the first book Dragon's Lair before this one to fully understand and appreciate this book and to especially understand Arrow. As I said on my review for Dragon's Lair I'm really picky over MC books but I love Chantal's work and I loved her first book in this series so reading this was a no brainier for me, it was a must read. As the last book this isn't your typical biker book as it isn't as gritty as most of the ones out there but that's what makes it so much more unique and such an addictive series. Anna is a college student and also under the protection of the Wind Dragons as she's the younger sister of club member Rake. 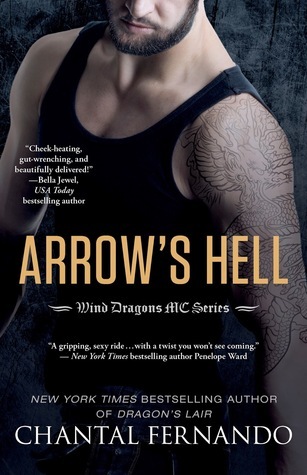 Arrow instantly feels something from her but if you've read the first book in this series you'll realize the reason he struggles to deal with his feelings. there's so much emotion in this book because of his past and him trying to deal with it and the guilt to and my heart broke for Arrow at a lot of points throughout this story. These two are perfect for each other but their relationship doesn't come without its ups and downs and Anna been Rakes little sister doesn't help matters either. this was truly an emotional story with the just right amount of biker grit for me. lets not forget the added sexiness that every Chantal book has that has hot in all the right places. I love this MC series and cant wait for the next book which is Trackers.